In 2016, the Mexican government passed legislation to open their electric and natural gas industries to competition. Since then, market participants have been cautiously feeling their way through the details of practical implementation. The Mexican reforms, as with other countries before it, began by deregulating the price aspects of the wholesale electricity and natural gas markets and are now moving forward with a phased-in (large customers first) approach for retail deregulation. For years, the Mexican electric market was controlled by a state-owned utility monopoly (CFE). CFE has now spun off its generation assets into an independent subsidiary. Like other markets, the delivery of the electricity and maintenance of the distribution grid remains regulated under the purview of CFE. An Independent System Operator (CENACE) began supervision of the new wholesale marketplace in January 2016. On August 12, 2016, the required demand threshold for Qualified Users, or eligible shopping retail customers, was reduced from 5 MW to 1 MW. This decision opened the market for many industrial and large commercial users. Wholesale Energy Prices shown above are driven by available power plants and transmission lines. As you might expect it is a geographical challenge to flow electricity along the Baja Peninsula and into Cancun on the opposite coast. The transmission line congestion and reliance on local oil-fired generation units result in higher prices in these locations. Prices are lowest along the U.S. border and trade in a fairly tight range around the nation's main population center, Mexico City. The process for shopping is complicated and end-users would be wise to seek professional assistance before proceeding. For example, applicants with a demand of 1 MW or greater need to apply electronically to CFE to become Qualified Users to contract for independent supply. For existing loads, the application requires the presence of one year of five-minute interval data, one year of billing statements, and the voltage at which load is supplied, in addition to other administrative information. The CFE will notify applicants of its decision within thirty working days of the receipt of application. At last check, there were nine suppliers approved as Qualified Service Suppliers. At least seven more have shown interest and are in the pipeline for approval. Time of Use (TOU) rates apply in Mexico and vary widely. For example, in the Central Region, peak-hour energy was 10.42 cents/kWh, Intermediate-hour 4.71 cents/kWh and base-hour energy 3.93 cents/kWh. Also, the CFE rates change monthly and thus do not provide price certainty. The value proposition for shopping customers includes savings and price certainty. Deregulation of the Mexican Natural Gas market is more complex than electric so we suggest you contact Independent Energy Consultants for details on the process for shopping, savings opportunities, and risk management strategies. For now, we would like you to know that pipelines are flowing gas from California, Arizona, and Texas into Mexico to support a competitive marketplace. This new demand for U.S. natural gas could cause prices to rise here and fall in Mexico. 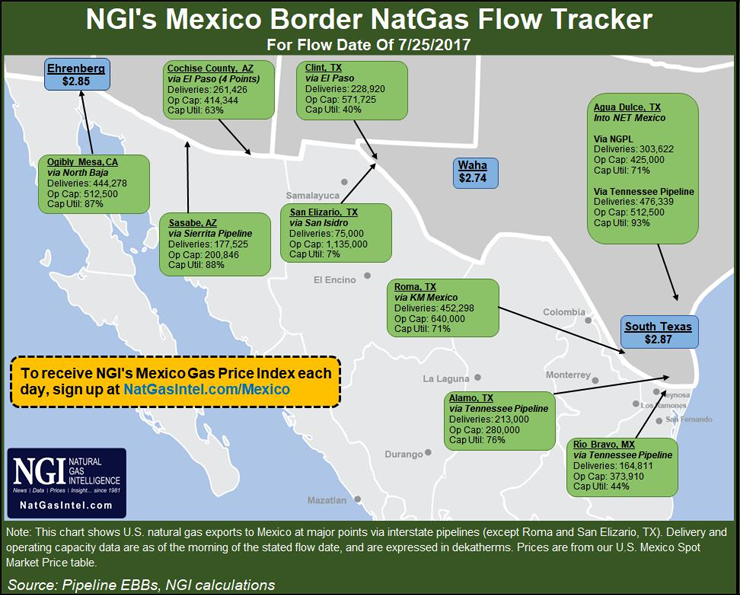 Shown below is a map of gas flows on a typical recent day where 3.24 billion cubic feet (Bcf) or 4.6% of our daily production left the U.S for Mexico. Some estimates predict this new demand for U.S. natural gas will approach 20 Bcf/day. That would exceed 25% of our current daily production of 71 Bcf/day! We do not believe it will go that high but this is undeniably a threat to push U.S. natural gas prices higher.